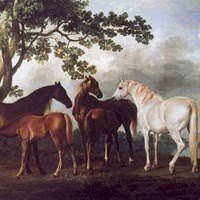 Biography of English Horse Painter & Equestrian Artist. One of the best English painters of the eighteenth century, George Stubbs was primarily an animal artist who painted horses, dogs, monkeys, rhinoceros, tigers, lions and giraffes. A highly skilled draughtsman and animalier, he spent much of his life studying equine anatomy, and his book on the subject Anatomy of the Horse (1766) brought him an international scientific reputation. Stubbs was equally successful when painting on a large scale as on a small, and his largest piece of equestrian art, Hambletonian beating Diamond at Newmarket is 13 feet seven inches by 8 feet two inches. Another large-size painting, of Hambletonian with a Groom and Stable Boy, is probably his masterpiece. It possesses a depth of vision and a magnificence of action which are truly Michelangelesque. In draughtsmanship, composition, and handling of paint, it is one of the finest pictures in English art. Other famous works include Whistlejacket (1762, National Gallery, London); Mares and Foals in a Landscape (1763-8, Tate Gallery) and Cheetah with Two Indian Attendants and a Stag (1764, City Art Gallery, Manchester). The tradition of animal painting was maintained after his death by the celebrated animalier Edwin Landseer (1802-73), who was famous for his paintings of dogs. Stubbs himself was 'rediscovered' in the 20th century, after his work had languished for many years in private collections. Stubbs was born in Liverpool in 1724. His background was not particularly wealthy, his father worked with leather, and Stubbs received little formal education. Despite this he discovered drawing at an early age and used to sketch animals in his local district. Information is scarce about his activities until he was 35. He appears to have developed a talent for portraiture and received some tuition from local portrait artist Hamlet Winstanley, an assistant to Sir Godfrey Kneller (leading portraitist during the 17th and 18th century England). Stubbs early career as a portrait painter took him to local towns, Leeds, York and Hull. Stubbs was interested, like many of the Renaissance masters (including Leonardo da Vinci), in extending his knowledge of anatomy, both in humans and animals. He made countless sketches and studies of both, learning the skills of his trade by observation. By 1751 his reputation was established enough to give private anatomy lessons to medical students. This lead to an illustration he made for a medical book on midwifery by Dr John Burton. He also studied etching, and was able to etch the plates for the book himself. In the 1750s Stubbs made exhaustive studies of animals, in particular the anatomy of horses. He rented a farmhouse in Lincolnshire and over a period of a year and a half he painstaking dissected animals and made countless sketches of his results. Apparently Stubbs was so convinced in the power of observation as a learning technique that he travelled to Italy in 1754 to look at the Renaissance masters. Studying Michelangelo, Titian and Da Vinci, he only reaffirmed his belief in the superiority of nature to art. In 1760 he moved permanently to London and began etchings for Anatomy of the Horse (1766), a book which became an important reference for artists and naturalists alike. He travelled regularly, making many topographical watercolour studies. He created a series of masterpieces at this time, depicting horses and foals. Some were commissions, horses owned by his patrons (Racehorses Belonging to the Duke of Richmond Exercising at Goodwood, 1760-1, Trustees of the Grosvenor Estate, UK; and John and Sophia Musters Out Riding at Colwick Hall, 1777). Others were horses Stubbs imagined in his head (eg. Wooded Landscape, 1760-2; Mares and Foals in a Landscape, c.1768, Tate Gallery, London). In about 1762 Stubbs painted one of his most famous paintings, Whistlejacket (National Gallery, London) - a famous racehorse belonging to the Marquis of Rockingham. Stubbs attracted the attention of many aristocratic patrons, who recognised his work as great as former historical horse painters like John Wootton, James Seymour and Peter Tillemans. By 1759 Stubbs was successful enough to buy a house in fashionable Marylebone, London, where he spent the rest of his life. During the 1760s Stubbs began to paint wild animal species. A product of his fertile imagination, he painted Horse Attacked by a Lion (1768-1772, National Gallery of Victoria, Melbourne). At the same time he was commissioned to paint the first kangaroo ever bought to England. He also painted the Moose in 1770 (Hunterian Museum, Glasgow); Zebra (1762-3, Yale Center for British Art, New Haven) and Green Monkey (Walker Art Gallery, Liverpool). In 1764 he painted Cheetah with Two Indian Attendants and a Stag (City Art Gallery, Manchester). Stubbs also became known for his paintings of dogs, including Sir John Nelthorpe at Shooting with Two Pointers (1776, private collection); and A Foxhound, Ringwood (1792, The Earl of Yarborough, UK). Stubb's paintings are described as naturalistic - naturalism as an art style is not precisely distinguished from realism, as both involve giving a representation of the real world in a convincing manner. Other examples of naturalism are the works of American artists like William Bliss Baker, whose landscape paintings are considered some of the best works of the naturalist movement. Other naturalists include the French artists Albert Charpin of the Barbizon School who painted sheep in their natural surroundings. In the 1770s Stubbs began to experiment artistically with enamel paints. He consulted with the famous ceramist Sir Josiah Wedgwood. Stubbs lived with Wedgwood during 1780, and created pottery plaques, paintings on ceramics and paintings of the Wedgwood family. In 1781 he executed a self portrait in enamel on an oval Wedgwood plaque, it shows the artist at the age of 57. Although Stubbs was elected an Associated Member of the Royal Academy in 1780, the Academy did not look too favourably on his new experiments. Their conviction was the oils and watercolour were the only true expression of a professional artist. Nevertheless, he was granted full membership of the Academy that year. After this period of experimentation he returned to oil painting, but preferred to work on smooth panels instead of canvas. Stubbs remained an active artist into his old age. He continued to attract wealthy patrons, including the Prince of Wales whom he painted on horseback in 1791. He died in 1806 and was survived by his son George Townly Stubbs, a printmaker and engraver. As the majority of Stubb's paintings were commissioned for private collections, and remained in those collections for many years, his work was only known in a narrow circle of aristocratic sportsmen. It was not until the 20th century, when many of his works came to market, that his skill came to greater attention, and ultimate fame. While no other sporting painter was the equal of George Stubbs, Benjamin Marshall (1767-1835) continued the tradition of Stubbs's work, and painted many hunting and racing scenes which have artistic merit. Paintings by George Stubbs can be seen in many of the best art museums throughout the world, including the National Gallery of Art, Washington; Yale Center for British Art, New Haven; National Gallery, London; National Portrait Gallery, London; Royal Collection; Walker Art Gallery, Liverpool; and the National Gallery of Victoria, Melbourne. For a modern equestrian artist, see: Peter Curling.